I remember so well, biting into glossy purple-black fruit with coral centers, the sticky juice running down my hand and over my chin, and eating down to the pulpy pit. 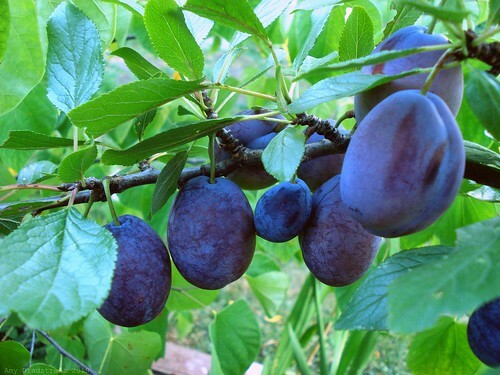 I ate so many plums beside lakes, on road trips, under the oak tree and always in summer. 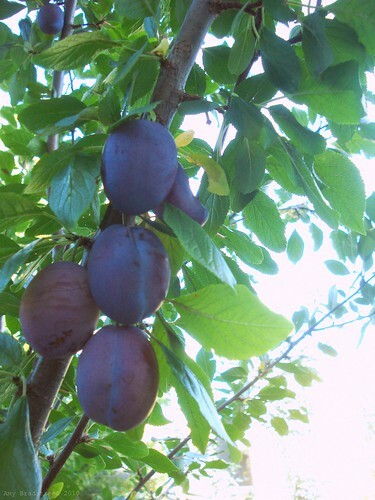 I remember my mother talking about the plum tree she had in her childhood garden and how abundant and pretty it was. 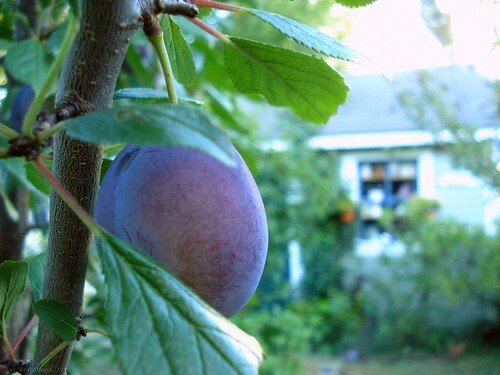 So when we were choosing some fruit-bearing trees for our garden, I knew I wanted a plum tree. Our Stanley Plum tree isn't very old, yet each spring it has put on beautiful white blossoms, its trunk grows thicker and the tree reaches up, higher and higher, filling out its elegant vase shape. Last year it put on a fair amount of fruit, but sadly, all of it was knocked off in one of many heavy rainstorms of last summer. 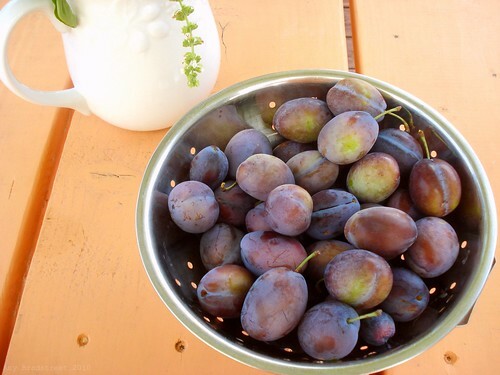 This year, however, we have plums. The squirrels appreciate our plum tree, as well, and we often spotted them up in the tree, stealing even the littlest green fruit. We tried to keep them away, we even fed them other food, but it never stopped the squirrels. It was hard to begrudge them such a delicious treat. I just wish they'd learn to at least finish what they took, instead of eating little bits off of many plums. At least the squirrels don't bury the half-eaten fruit in the garden, like they do the stolen peaches. Alex is convinced the squirrels think the peaches must be some kind of special walnut. The ripening fruit was only becoming more enticing to the squirrels, so we've picked all the fruit. 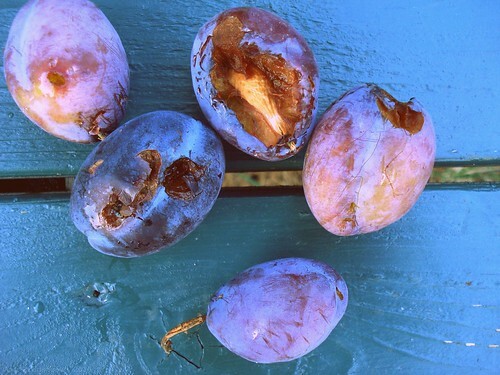 Some of the plums aren't completely ripe yet, but some are, and oh, how good, a bit sour on the outside, so sweet on the inside. 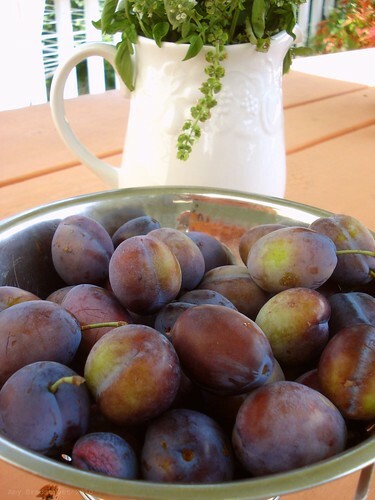 Perhaps some summer plum jams and cobblers will round out our summer meals, but for now we're very happy to eat them out of hand and let the sticky sweet run down our faces and hands.